New Zealand has such a small population that – with help – I’ve been able to identify most features filmed in New Zealand between 2003 and 2017 and written and/or directed by New Zealanders. Most on this list have been released (with a few that may never be) and all have reached at least pre-production, according the information I have available. The list in general excludes feature documentaries. But it includes some hybrid works for cinema – Home By Christmas, Rain of the Children, Love Story, The Red House, Beyond the Edge, Giselle, The Deadly Ponies Gang – and some heavily scripted work for television, based on real life events. I've attempted to classify the films according to the contribution of women writers and directors and whether they have female protagonists: my definition of 'female protagonist' excludes heterosexual 'couple' films like Sunday and multi-protagonist work like Apron Strings, but not My Wedding & Other Secrets, because of its perspective. Please let me know of any additions and/or if you’d like your information amended. TF: Taxpayer Funded – for development and/or production and/or post-production, by the New Zealand Film Commission (NZFC), New Zealand On Air (NZOA), Creative New Zealand or other central government or local body film scheme. NZFC-funded features are usually also NZOA-funded. There are many ways to approach this data. My focus is on women-written and -directed work and on female protagonists and their presence in taxpayer-funded projects. So, here are two kinds of pie-chart. The first two include mixed gender writing and directing teams. The second two refer only to those features that are written or directed either by a man or by a woman. For me, it's important to focus on the proportions of these features where women write and/or direct on their own and in the lists above to break down the data further by reference to women who write for men to direct, women who write female protagonists, etc etc. 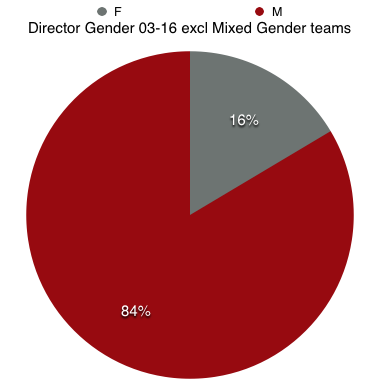 And the 16% (director)-21% (writer) representation of these women are sufficiently similar to argue that any gender policy has to take equal account of both, without privileging the director role. Even if women's storytelling and eyes are strongly affected by consistent exposure to the men's storytelling and the male gaze it's possible they/we will be more autonomous outside a mixed gender team, which is in my view more likely to privilege the 'male gaze' and sensibility than women writers and directors who work independently. 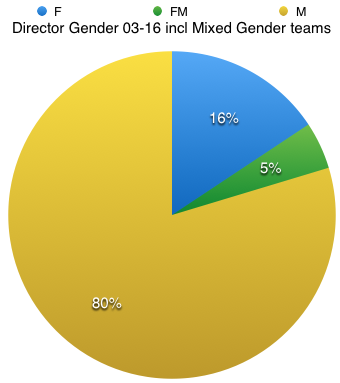 There are various reasons for joining a mixed gender team, often very good ones, but I think it's likely the combination changes the dynamics of the work made (as well as making it more likely that the project will have access to necessary resources). In a mixed gender writer or director team, a woman is sometimes included primarily to advise on female characters. On other occasions, life partners like to work together, as writers and/or directors with complementary skills of various kinds. Or, a more experienced male director may be there to support a woman directing her first feature or during a shift to or from documentary to narrative. 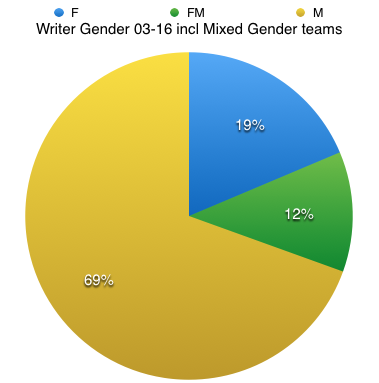 We can also consider the proportion of female protagonists in all local features to March 2016: 16.7%. And they're worse for TF features. 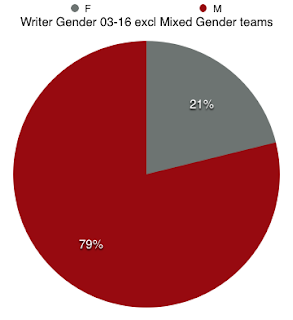 Of these, 17% had female protagonists *but* only 6.5% were written and directed by women *and* had female protagonists. Michael Stephens, whose ongoing and generous collegiality I much appreciate. My PhD Development: Opening Space for Women's Participation in Scriptwriting for Feature Films? Many thanks to Benedict Reid for some excellent fine-tuning and additions!